From family to strategy, kids to adults, this database spits out great recommendations every time. It is not always easy to know what games you'd love in the contemporary glut of board games. Sure, we all know standbys like The Settlers of Catan, Diplomacy, or Carcassone, but what about more obscure games? What about games you can stand to play with your family? Your youngest siblings? Your drunk friends? There's an app for that. Well, a web app. Enter boardgamesfor.me, the personal project of a web developer who wanted a finding your next game purchase to be a little easier. It's a no-frills tool, but you don't need it to be. 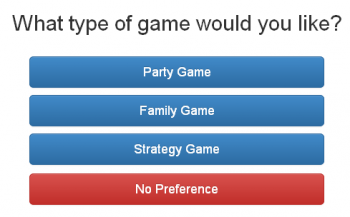 Starting from a few general categories based on which niche in your game time you need to fill, the site narrows down your choices until you've got only good stuff left. "The database was built combining output from [Board Game Geek] and Amazon's APIs, with some manual editing where things were lacking," the site's creator told The Escapist. The site's final output gives you a short description of many games, with links to amazon for buying. Those are affiliate links that help support the site. "Money will be used for hosting, updates, design, and maybe a new board game if I ever have extra" said the creator. So go check out boardgamesfor.me. You won't regret it. Still, it's fun popping in details and spotting which games I've already played. I think it's quite heavily weighted towards games with high ratings, and since it only shows about six games at a time it never quite gets to games with high-but-mixed consumer responses. Hi The_Darkness and JonB! I'm the developer of the site and wanted to respond to your posts. Also, I do weight the site towards high rating games because odds are more people will like them. That said, I am looking to improve the recommendation algorithm and also add cool features that allow you to import your own collection to use with the recommendations. That is down the road, but it's on my list. If you, or anyone else has any feedback for me, I'll be checking here throughout the evening. Thanks! The Battlestar Galactica board game is the 24th highest rated game on boardgamegeek (another great board game site btw) and has 4.8 stars on Amazon. I wouldn't exactly consider the reaction mixed. OT: Tried it a few times, and while I had heard of most of the top responses, and played many of them myself, they are pretty much all good games. I can see this site being good for someone who is just getting started into board games. One more thing to note, you can use the "Advanced Filters" section on the side to make your results more accurate. Experience players will get a lot more out of the site using those options (and hopefully more filters to come). All joking aside, this is a good site for newcomers to find solid "gateway games". I just had to remind myself that I'm not the target audience for it. Okay, I love the filters, makes it really easy to find games that aren't generic fantasy settings. You sir/madam have just made my day. It's pretty spot on, but I lost all faith in it when it called 7 wonders "simple". It took us an hour to figure out how to score the first time we played and we did it wrong anyway. I think this is the tenth time I've been told how much I'd like Pandemic.